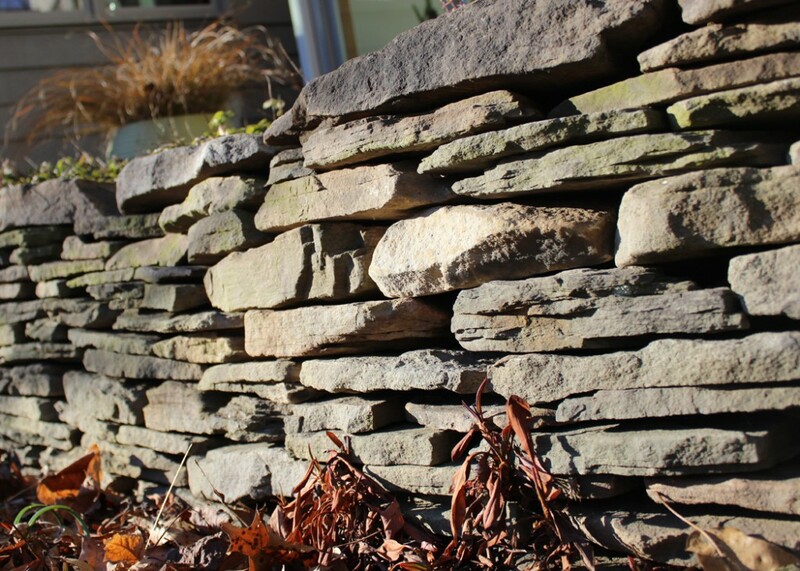 Natural stone retaining walls are functional and beautify the garden. Beauty – aesthetics are important in any landscapes. A well designed retaining wall is beautiful as well as functional. Structure – a well designed retaining wall will help to arrange and organize your garden. In city and urban settings, retaining walls are utilized most often to increase the level planting space around the foundation of a home. They add textural contrast to the plantings and help to blend the home into the landscape by extending the structure of the home. The incorporation of these walls into the planting bed adds to the beauty and curb appeal of the home. 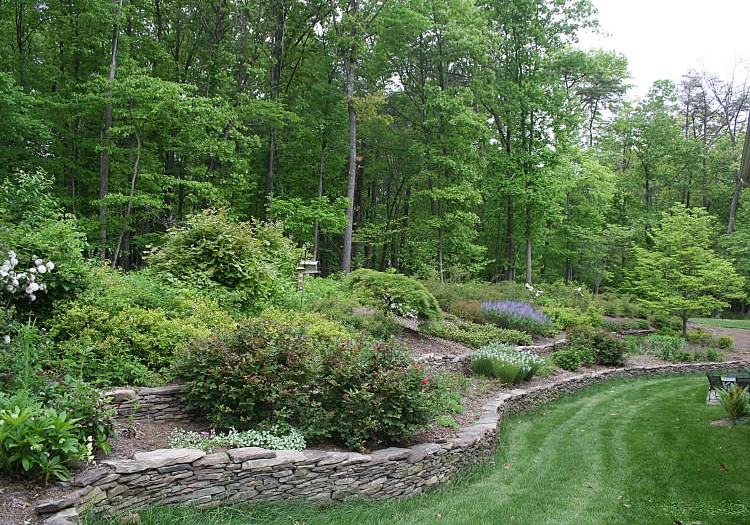 A sloping yard or a severe change in elevation can be considered a drawback in creating a garden. However, a sloping rear yard can often be transformed into an aesthetically appealing usable space through the use of retaining walls. Clever use of terracing retaining walls can create a lawn space to enjoy, a level patio area or simply a beautiful garden with all the plantings sloping toward the viewer. Steps and paths added through the walls add to the intrigue and usability of the hillside space. Well draining soil is often hard to achieve in our Northern Virginia area and raised planters are often used when growing plantings needing good drainage. Vegetable and herb gardens are great candidates for growing in raised planters. The height of the planters can be built so the side walls can be used as seating walls if desired. Once the decision of whether or not to include retaining walls in your landscape has been made and the location chosen – now to decide the product and style to use! Popular material choices in our region include brick, concrete, stone veneer, interlocking concrete segmental retaining walls and fieldstone. We tend to favor dryset applications because of their natural beauty and longevity. A dryset stone wall adds a sense of old-style character to a landscape or garden. Dryset is a mortarless construction method. The strength of the wall is not dependant on the bond between the mortar and the stone. These walls last for years. Many in the United States were constructed when the Europeans first settled in America and are still standing today. This stone is found locally, indigenous to this area, and a well constructed dry stack stone wall will last indefinitely. Varying thicknesses of stone are stacked on a gravel base and set into the hillside with a gravel and rubble backing for drainage. This time consuming construction method requires skillful arrangement of just the right stones to meld together and create a sound wall. 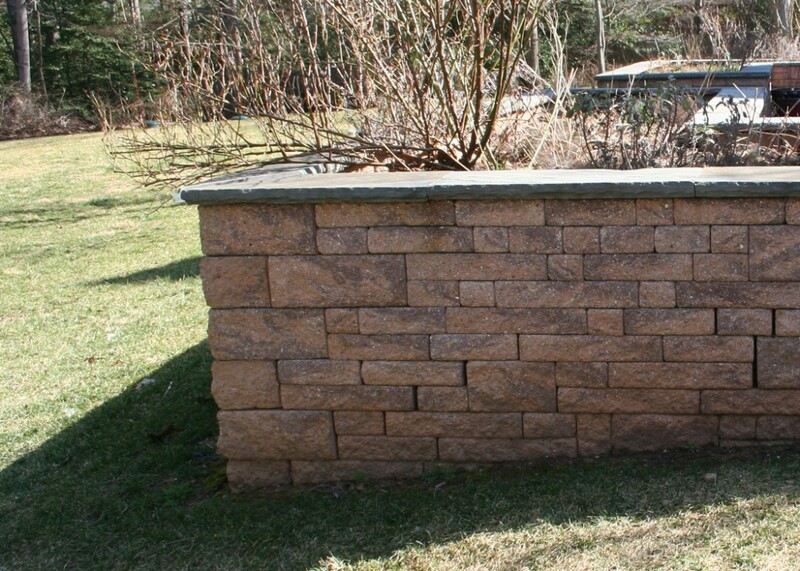 The placement and carefully chosen cap stones are essential to the longevity of the wall. Walls constructed in this fashion will be longer lived than mortar based walls as there is no mortar to crack and disintegrate. The stones themselves are melded together and will move with the earth during the seasonal freeze thaw cycles. 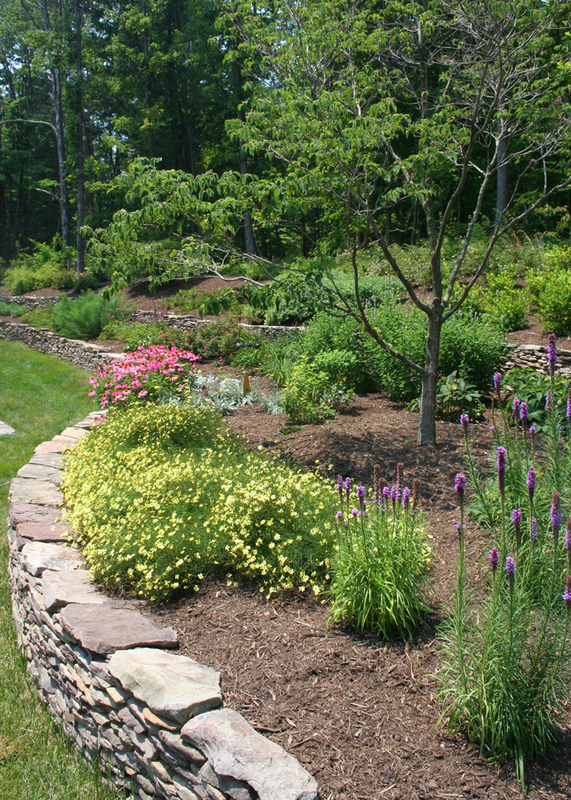 Fieldstone walls are perfect for providing a “sense of place” to the landscape and are well suited for natural gardens. Concrete segmental walls are constructed with manufactured modular concrete blocks that interlock with each other Concrete segmental wall offer a wide selection of colors, shapes, sizes and textures. This is great choice for modern landscape themes. They also are ideally suited for creating planters and are the best selection for walls exceeding 24” in height in a mortar less construction method. There are a number of different manufactures and many interesting styles and color choices available. Give us a call. We would love the opportunity to discuss the possibilities of creating a one-of-a-kind garden.